Our clients were referred to Build Professional and approached the team in search of a builder to complete the works and to quote their home extension plans as per their completed architectural plans. After receiving three quotes from three builders for their proposed home extension they were disappointed & deeply concerned that their extension plan was going to cost much more than their anticipated budget. Our clients turned to Build Professional for a solution and professional advice following the realisation of not being able to proceed with the planned extension. They came to the conclusion that they required a different approach and felt confident in our team’s specialised capacity of blending creative design with our knowledge of structures and a fundamental understanding of the costs of remodelling work. Financial transparency was paramount for our clients and we were certain that we could deliver what they required in their home for a budget that they were comfortable with and so our design and build journey began! A design consultation was held and we progressed through the process of carefully listening to their family needs, lifestyle requirements and aspirations for their home. Their designated budget was also discussed during the design consultation. The discussions were based around the demand for extra living space separate from the kitchen, added bedrooms for their growing family and a desire for a wine cellar. The design solution that the Build Professional team established for the home was to add an upper floor extension as well as extending out the front of the home together with remodelling components of the existing home to achieve everything and more that our clients desired. The upper floor extension would comprise of additional bedrooms, a bathroom, a large rumpus room, study area and spacious landing. This level would future proof the home offering a completely separate living, sleeping and study area. The upper floor extension was also designed to enjoy the northerly aspect together with the stunning tree-top and in winter, views directly to Parliament House in the foreground and Black Mountain as the backdrop. The upper floor design also adds a sense of grandeur with the large void, solid timber staircase, stunning feature window and crystal chandelier. The design solution for the existing part of home was to extend the current living space out the front of the home to create a separate, large lounge and dining area complete with a Cheminees Philippe fireplace, again capturing the northern aspect and leafy outlook. It was essential that this formal area could be closed off from the current open kitchen and family room. The remodelling design component required transforming a current bedroom and entry at the front of the home to create a new, separate grand entrance, solid timber staircase and soaring void. The storage underneath the staircase provided the solution for the wine cellar. The exterior entrance design was appealing and added another living advantage with the tiled patio and glass balustrade providing a new outdoor area and the tiled planter box also added a connection to the outdoors from the lounge room window as well as complementing the modern grey tiles with greenery. 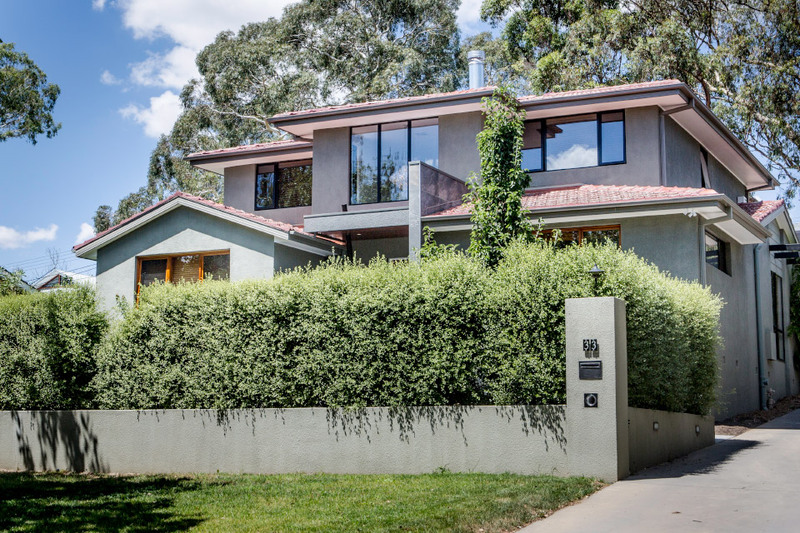 The design of the exterior was another important aspect, the upper floor extension was designed to sit seamlessly within the streetscape and among the classic homes of Red Hill. However contemporary design was added with the covered entrance boasting a tiled blade wall, timber clad eaves, glass balustrade, feature void window, tiled front entry, stairs and planter box allowing the variety of modern materials to complement the classic and elegant design. To achieve so much in the design, including living space that they weren’t even contemplating, within their desired budget absolutely delighted our clients. Finally they could comfortably proceed with their dream home extension with financial accuracy. Construction began in June and was completed in November, including a total of 29 rain days disturbing the construction schedule. The planning involved in this project to design a construction schedule in our discussions and process for our clients was imperative as our clients lived through almost the entire process, through the depths of winter and one of Canberra’s wettest winters on record! Access to the block was extremely limited for the scope of the project. Coordination of trades, deliveries and safe movement of access for our Clients required detailed planning and execution. Clever planning of narrow scaffolding provided more than just a safe means of access for the workers. It created a separation of the work space on the driveway so that our clients could drive past and access their garage with minimal disruption and a storage area for lightweight materials trafficked from the delivery drop off area at the front en-route to construction. We were able to recycle many materials during the project to save on waste and landfill. Some of these examples are the re-use of cedar windows to the north being single glazed; they will allow solar access to the living area coupled with blinds to prevent the loss of heat of an evening in winter. The front door and jamb was re-used. All the old timber from the project was recycled by the owners for their heating use in the fire. The removal of timber flooring was recycled for use in the front entry porch ceiling. The home has been upgraded to a 6 star EER and reports from our clients that it performed extremely well during the summer months. While naturally, the heat rose to the upper floor, they could easily expel the heat by opening the windows to allow good cross-flow ventilation. Proof of this working was in the fact that they didn’t operate the air-conditioning during summer other than just to test it was operating after commissioning the system. We are interested to see how the home performs during its first winter. This project was a great partnership & collaboration between our clients and the Build Professional team, assisting them on their home extension journey and providing them with the complete design & build process together with financial transparency was an absolute pleasure and filled the team with pride to see what we had achieved together. The transformation of our client’s home is a great success. The function of the home extension and remodel has improved their lifestyle immeasurably, increased the value of their home without over capitalising and future proofed their home. The integration between the old and new is seamless and the upper floor extension sits harmoniously within the home completing a complimentary and gracious street presence.